I bolted upright in bed that morning, as dreamers often do. The man beside me laid still, warm under covers, though I had thrown back my side of the blanket in the suddenness of the vision. Grabbing for the journal off the nightstand and the pen still sleeping between thin bible pages, I swung my legs over the side of the bed and sat there recording the inspiration. A little backstory: My entire career before motherhood was as an actress, and that’s a big part of my God-sized dream today – how God can take a career out of the world and use it for His own glory. Today, amidst the blessed busyness of motherhood I still act, only now I perform monologues for women’s retreats, MOPS groups, conferences, and churches. Following each one-woman show, on the other side of tears and laughter, comes biblical application, teaching, or a simple Gospel presentation. It’s my dream, and it’s big and takes courage, but God is in the business of gently leading those He calls. Later that morning, after I’d fed three kids, and the man who slept those few extra minutes beside me, and got them all successfully out the door to work and school, I hunkered down over my phone and sent a short note to that women’s ministry director who was knee deep in the planning of their annual retreat. I shared, with the fluid motion of thumbs communicating inspiration via text, my idea for the piece I’d just started writing and asked if she would like me to craft it specifically for their event. I sent my offer then turned to the sink to finish breakfast dishes. From there I toured little boy rooms to see if beds all got made. Pajamas were strewn about, a towel was crumpled wet on the bathroom floor, and I discovered that one of my children had his bed made… in his closet. I wondered at what time he had moved himself there during the night. When I walked back to my kitchen with an armload of plastic cups left on bedside tables I saw my phone, lit up with a text. It’s amazing to me how quickly embarrassment can fall upon the heart of a dreamer who has dared to do the hard work of bringing those dreams to life. Taking bold steps in faith and offering those dreams to others – baring our hearts – our words, our ministries, our songs, all of it open wide for rejection. The word catches me even now. Offering. How dreams are like offerings to the Lord when we lift them up and step out in faith. (<====Click to Tweet) So much like the bills we slip quietly into the plate on Sunday mornings. Offering. The way women serve their loved ones all year long and then the next year too, round and round, 365 days of offerings each year. And each offering is given as unto the Lord. At home. At church. On the Internet. In your neighborhood. Dreamers holding dreams with open palms, saying, “Would you like this? Would this bless you?” Can you see it with me? How the dreamer must continually make these timid, hands open, fingers spread wide, offers? 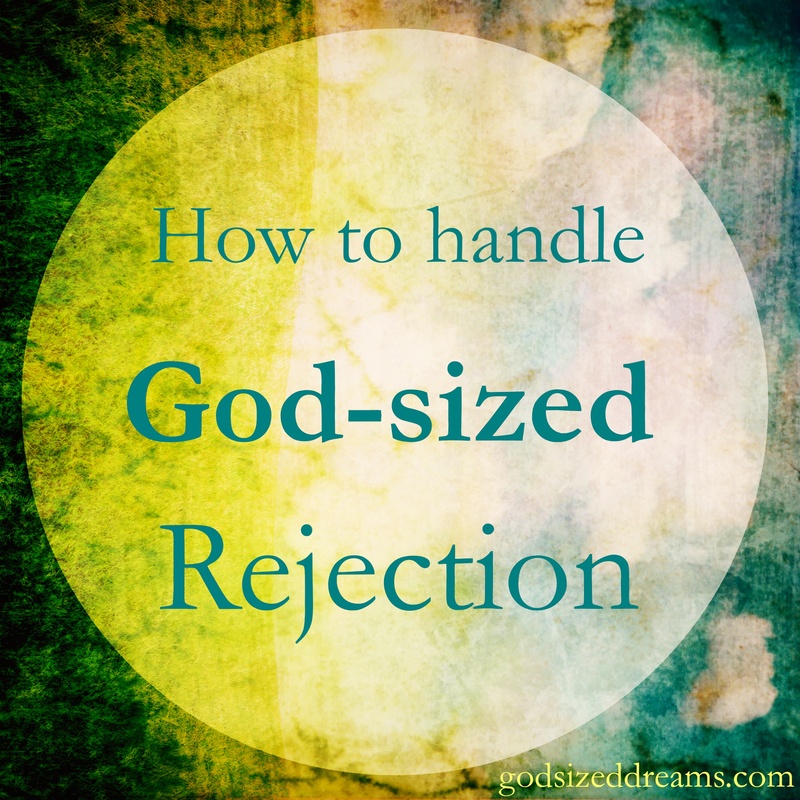 But here’s the secret to God-sized Rejection: We are not accountable to God for the reception of our offering, just as we cannot control what a homeless man does with the bills we place in his hand. We simply are called to give, to offer, and to keep offering in faith. Would you commit to keep doing that today… tomorrow… and the next day and the next? Pouring your dreams out, regardless of the cost? Would you? Will you? Wendy Brunner is a trained Actress and heartfelt Bible teacher, Wendy ministers to women’s hearts through storytelling and Biblical life applications. She utilizes drama, comedy, poetry, and the study of God’s Word. During her career in Hollywood, on shows such as JAG, Melrose Place, Star Trek Voyager, and Roswell, Wendy found herself longing to tell stories that edify and encourage women! In fact, that was her God-sized Dream! She now writes memoir styled posts at Wendy Speake. And she delivers dramatic Bible studies that move audiences closer to Jesus. Wendy resides in Southern California with her husband and their 3 ruddy boys. Oh I need this reminder..when I get so wrapped up in the answer, the end result…I need to remember that I should try and be satisfied with my offering, my willingness to do God’s work, regardless of the result! Wendy, this is such a great reminder. It’s important for me to remember that my offerings are enough! Love you friend!